We are inviting 2nd, 3rd, 4th and 5th year undergraduate students along to our Go Away! Launch Event next Thursday 8th February. The evening will start with a drinks reception and nibbles before a presentation on the fantastic summer programmes available to the School of Engineering students. You are eligible and encouraged to apply to the Principal’s Go Away! Fund. A successful application would cover your reasonable travel expenses AND your accommodation (£350 - £700 range allowed). 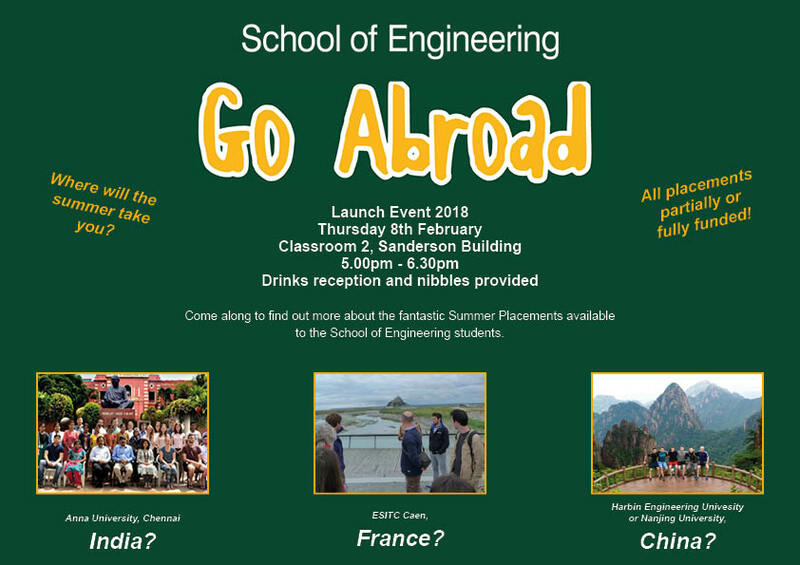 If you are unsuccessful in your application for the Go Abroad Fund then The School of Engineering will offer you some support towards your costs. If you plan on coming to our Launch event then please sign up on LEARN > Engineering Infomation 2017- 18 > Go Away!